This house is really quite weird as it was based off of what I can remember of a dream I had last night. All I've got in the way of pictures at present are screenshots of each floor's floor plan. No flooring, walls not painted, doors in place but no windows, and just barely started on the furniture. Ground floor. 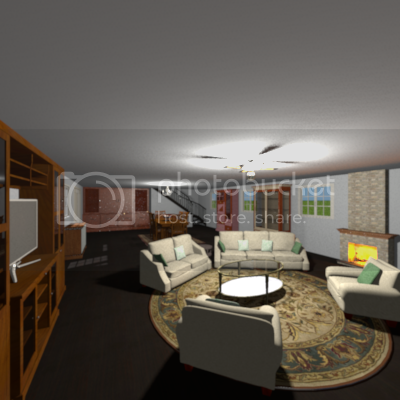 I'll be designing the Great room into both a living room and dining room. All the rooms are labelled. You'll also notice the large open area in the middle; it's an Atrium. At present, it's a big open hole. First floor. Here's the floor that was in my dream last night. As you can see it is quite weird (at least I think so, I don't know if it's weird to anybody else). Yes, that's a very large Nursery there on the left; I believe it's both a baby's bedroom and playroom rolled into one. 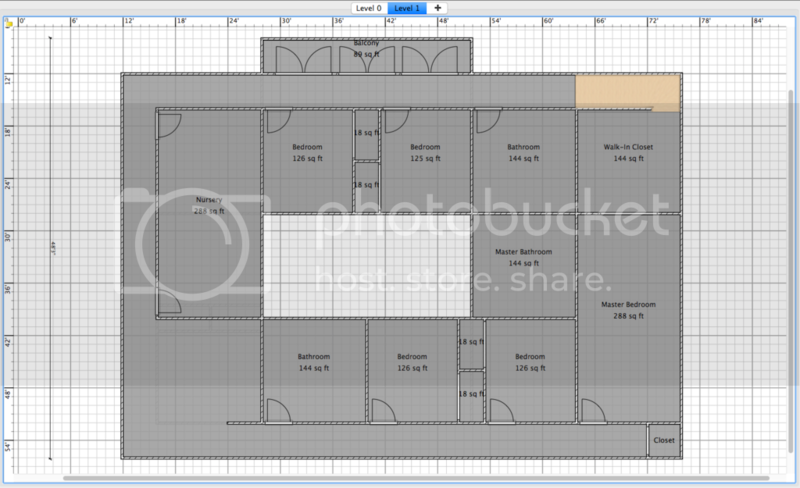 Plus, it also looks to me like it can be partitioned off later to make two separate bedrooms. I realize that there's this really odd nook there next to the Nursery. In my dream, it was just an open area that I was claiming as my "sewing room". I have no idea why I was dreaming of this; it happens sometimes though. Thing is, in my dream I was moving in with a husband and wife, their teenage sons and another older lady. Seems to me that there could be plenty of help there. plus, it is free ! I have done up the Great Room. It has however now put this very large house into the "WAY TOO BIG FILE" category. I've decorated them while being tired; not a good thing. Not that the room doesn't look good, but that it looks rather cluttered in some places and completely bare in others. I've been working on the kitchen today. I think I have it the way I want it, generally. 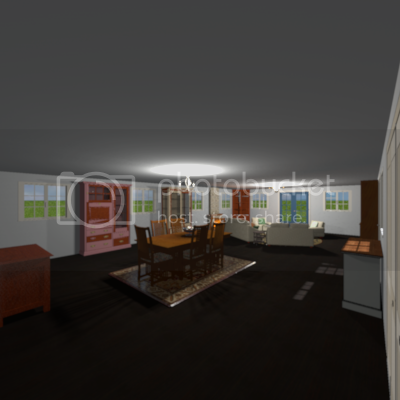 I've added a double door from the kitchen to the family room which wasn't noted on the floor plan screenshot in my original posting of this thread. 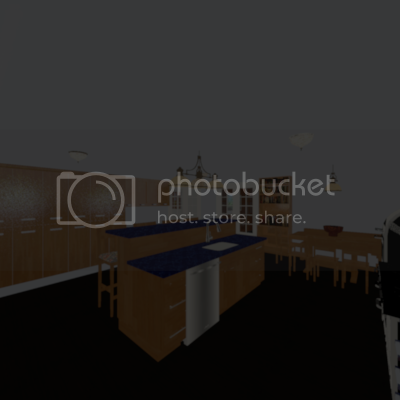 That is what I have the Virtual Visitor standing in front of looking into the kitchen here. I've got one of those corner breakfast nooks there on the left with extra seating around it. Also there on the left (with just the corner of it showing) is a bookcase, for the cookbooks and such that can be useful in a kitchen. For some reason the color didn't come out right on the vintage stove I put in; it's supposed to be mostly white, but came out checkered in the rendering. Oh, well. There's the refrigerator to the left of the folding doors that lead into the Great room. I have a nice big island there in the middle with bar stools for even more seating. 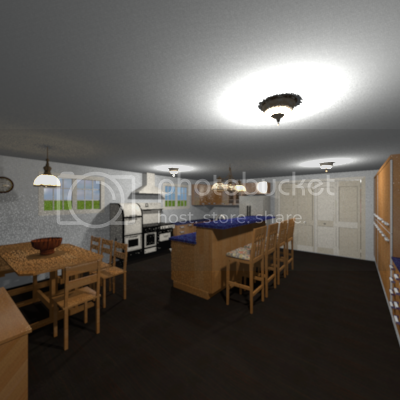 On the right is a row of pantries and additional storage. Just out of shot on the right is the double doors leading to the small atrium area. This is from the opposite corner from that first shot (I've got cabinets behind the Virtual Visitor). The front edge of the vintage stove is just visible on the right. The sink and dishwasher are now visible on the island. 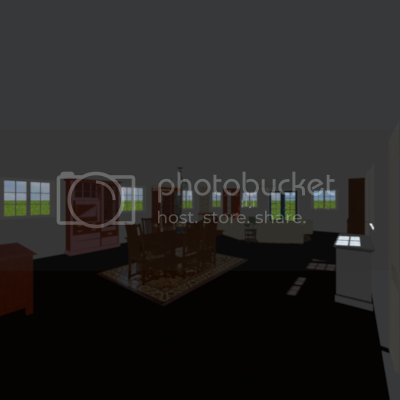 Both the double doors to the family room and the double doors to the atrium area are visible here (these areas appear dark because I haven't worked on them yet and as such haven't added any lights in either of them). A slightly better view of the pantries there to the left of the double doors, and the bookcase to the right. This house is still a work-in-progress; when I get more done I'll post more on it. I did work on the ground floor L-shaped hallway but because it's so bare I didn't think it worth taking pictures of. I added the flooring and the paint as well as the windows on the left sides at even intervals. But why all the lights are always 'On' ? You do not pay electricity in the US ? Do you know about global warming ? I would use the open centre space as an "atrium" with pond and plants?" with a staircase, and a landing, thus moving all rooms to the outside. The long outside hallways would be perfect if on the inside, surrounding the open "atrium"(clear glass panels all around for ground floor. and glass balcony for upper floor walkway looking down onto "atrium". I kinda like your design. PS! Please do not feel offended if my idea is conflicting with your dream. bdfd thank you for the encouragement. 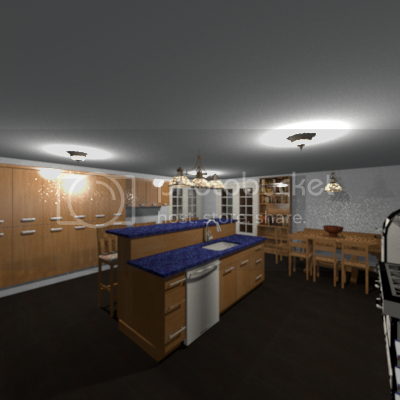 As for the lights, the rooms would be really dark when I render them, as below can attest. JUGGERNAUT thank you for the suggestions; they are all very good and I might try them out. I don't feel offended concerning your ideas as when I said dream I meant "nighttime subconscious visions" and not "fantasy". It was just a weird dream with the details being only of the upstairs bedrooms (NO BATHROOMS, YIKES!) and who was there. As a matter of fact there was no central atrium in the dream that I recall; it was actually that I couldn't figure out what to do with that space when I was trying to figure out the bizarre layout.